A Hosted VoIP System Comes with Real Benefits - Decatur Computers Inc. Blog | Decatur Computers, Inc.
By its very nature, a VoIP solution that is hosted in the cloud is going to provide you with a few bonuses over one that you would host yourself that specifically help make your business safer. You have experts on your side. A VoIP solution requires no small amount of maintenance to defy the many threats that could potentially corrupt it. Hosting your solution in-house means that you are responsible for keeping it secure and operational. However, having your VoIP solution hosted means that your provider is the one who has to carry out these tasks, freeing up your staff to focus on their work. Management and monitoring are easier. One of the biggest threats to your security is presented as you try to juggle too many disparate systems. 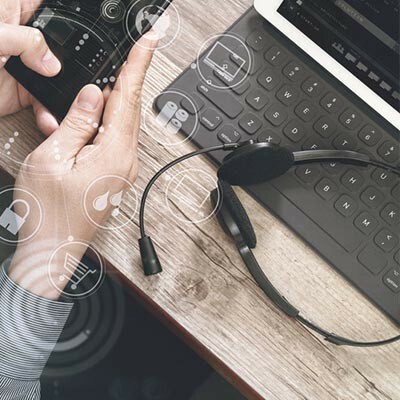 A hosted VoIP solution is standardized, making it easier to manage and far simpler to catch security breaches that would otherwise come in through your communications. Twofold security benefits. In addition to consolidating your chances of being attacked, most VoIP solutions come packaged with comprehensive encryption to protect your conversations from peering eyes and ears. By encrypting each call’s data before it leaves your VoIP device and decrypting it only when the call has reached its destination, a VoIP call is that much more secure than it would be otherwise, protecting your business’ resources and assets. Of course, while security is important for any business’ success, you have other things you need to worry about as well. Functionality is a pretty big one of these. Leveraging a hosted VoIP solution enables you to do a few additional things. For instance, a hosted VoIP solution can feature a few capabilities to help directly improve your operations, like the ability to forward a call to a mobile device, or to set basic phone settings more easily. We would be more than happy to discuss what a hosted VoIP solution is capable of. Reach out to us at 217-475-0226 to learn more.